We’d love your help. 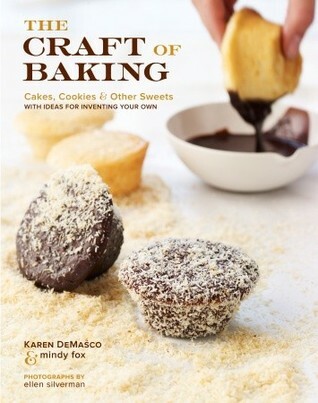 Let us know what’s wrong with this preview of The Craft of Baking by Karen DeMasco. James Beard Award--winner Karen DeMasco, who first came to national attention as the pastry chef of Tom Colicchio's Craft, Craftbar, and 'wichcraft restaurants from 2001 to 2008, approaches the art of baking in a unique way. Building on the savory cooking philosophy of using seasonal ingredients to create dishes with pure flavors, Karen makes acclaimed desserts that are bo James Beard Award--winner Karen DeMasco, who first came to national attention as the pastry chef of Tom Colicchio's Craft, Craftbar, and 'wichcraft restaurants from 2001 to 2008, approaches the art of baking in a unique way. Building on the savory cooking philosophy of using seasonal ingredients to create dishes with pure flavors, Karen makes acclaimed desserts that are both simple and elegant. Now, she shares her secrets and techniques in her first cookbook, The Craft of Baking, designed to help home bakers think imaginatively in order to expand their repertoires with new and fresh combinations. Using the bounty of the seasons as inspiration and Karen's clear instructions, both beginners and experienced bakers will find it easy to let their creativity take the reins. Learn how to make Karen's celebrated sweets, such as Apple Fritters with Caramel Ice Cream and Apple Caramel Sauce, White Chocolate Cupcakes with White Chocolate Cream Cheese Buttercream, and Raised Cinnamon-Sugar Doughnuts. Then check out the tips on "varying your craft" to transform Grandma Rankin's Cashew Brittle into Pumpkin Seed Brittle and to alter a cobbler recipe to make Rhubarb Rose Cobbler in the spring or Mixed Berry Cobbler in the summer, for example. Karen's suggestions for "combining your craft"-such as serving Almond Pound Cake with Apricot Compote and Lillet Sabayon-reveal how easy it is to take desserts to the next level. To ask other readers questions about The Craft of Baking, please sign up. This is a great book for anyone who loves to bake or wants to learn. All the recipes are east to read and the ingredients are easy to find, if you don't have them in your pantry. Start from page 1 and try each and every recipe, they all are delicious! Karen DeMasco, once pastry chef for Craft and Craftbar, composes a baking book with a focus on simple and elegant seasonal desserts that verge beyond the traditional with unique, inspirational takes on classics. The book starts with a pantry primer which sticks with easy to find ingredients with the possible exception of vitamin c powder. Following this is a technique section, which is a nice introduction to basic baking techniques like how to prepare and clean up after caramel or temper chocola Karen DeMasco, once pastry chef for Craft and Craftbar, composes a baking book with a focus on simple and elegant seasonal desserts that verge beyond the traditional with unique, inspirational takes on classics. The book starts with a pantry primer which sticks with easy to find ingredients with the possible exception of vitamin c powder. Following this is a technique section, which is a nice introduction to basic baking techniques like how to prepare and clean up after caramel or temper chocolate. This is a clearly written, useful section. In addition, building your craft sections throughout explain how to innovate with a recipe, varying your craft provides other uses for the recipe and combing your craft provides ideas for putting multiple dishes together to create more elaborate desserts like using panna cotta with cherry compote served with graham crackers. Hints are also added within recipes. The title excited me, making me think that it would be more than a recipe book. The book does a fair job of laying out some fundamentals of a good baking pantry. However, there are two types of unsweetened cocoa powder: natural and Dutch-processed, and the author doesn't specify which kind is called for. After I noticed that, I didn't trust the recipes. I finally chose the Lamington Cupcakes because I love things with specific names instead of modern titles such as "braised pork with carrots, ce The title excited me, making me think that it would be more than a recipe book. The book does a fair job of laying out some fundamentals of a good baking pantry. However, there are two types of unsweetened cocoa powder: natural and Dutch-processed, and the author doesn't specify which kind is called for. After I noticed that, I didn't trust the recipes. I finally chose the Lamington Cupcakes because I love things with specific names instead of modern titles such as "braised pork with carrots, celery root, and potatoes." The cupcakes are bakes without cupcake liners and then they are supposed to be iced and dipped in toasted coconut. I made the icing, but was skeptical of it because it had so much confectioner's sugar in it. I didn't like the taste, and so we ate the cupcakes plain. They were quite good halved and toasted, but I lost interest in trying additional recipes from this book. The plus was there are some interesting flavor combinations and suggestions for changing some of the recipes to match what is in season. We tried the graham crackers. Meh. I am not a fan of buttery graham crackers. They were more like honey shortbread. Short on graham flour, heavy on butter. We also tried the coconut marshmallows. They are pretty good, but just not something I think I will be craving. I also question how a batch of marshmallows that completely fills to the brim a 12 x 17 pan can The plus was there are some interesting flavor combinations and suggestions for changing some of the recipes to match what is in season. Truly great cookbook. Clear and concise recipe writing, with good suggestions for using your own taste and instincts to expand on what's here. Several of these recipes have become favorites, and have made me the hero of office birthday parties. Some that I love: milk chocolate hazelnut panna cotta, cashew brittle, carmelized apple skillet cake, banana tarte tatin, raspberry granola bars, spiced caramel sauce. If you ever have occasion to make sweets, just get this. I read through these recipies and went "aha!" a lot, because there are tips on varying recipes with additives and how to adjust your basic crust/dough/etc for acid/liquid/etc content of said additives, as well as how to make things savory from sweet and vice versa. This is wonderful, wonderful. Cashew brittle got a lot of compliments (even though I was afraid it would take out everyone's fillings!). Really want to try their recipe for brioche in a soup can, but don't have much time for baking lately! I made two different recipes from this book--the yellow cake and the carrot cake. Both were quite good. It seems like a trustworthy general baking book, and I like that it encourages you to be more creative and try new spins on things. Didn't really wow me and some of the items are very expensive to obtain. One of her sources has a minimum of $250 for an order! Seriously, for a home baker unless that is a bit steep unless you are baking for a business. i liked the part of the book where the author gave explanation for the baking pantry and layed out all the different ingredients you have to have and the best brands for each. the section of baking methodes was very informative. so far this is a pretty amazing cookbook for a baking beginner. The recipes are yummy and easy to read. Also, there are idea about how to change up the recipe if you wanted- the recipes then turn into blue prints for you to build a ton of things with. Beautiful pictures, good explanations of some techniques, and has some good recipes, but it's a bit inaccessible because some recommended ingredients are very expensive. Looks gorgeous on my shelf but I only use it a few times a year. I prefer my cookbooks to have more pictures and more recipe description than this one did, though I appreciated the pages discussing how to modify a certain recipe and would have liked to see more of those. So I realize cupcakes are somewhat passe, but I'm still excited to make the gingerbread cupcakes (using Guinness) with candied ginger frosting!! I was especially fond of the "ideas for inventing your own." The pics are mouthwatering. Gonna show it to my sis for some food photography inspiration. :) But will most likely only dream about making the Nut & Cherry Nougat. Some incredibly delicious recipes, gorgeous and mouthwatering photos, and ideas for creating your own recipes. This is a must have. Such a good reference book. Many of the recipes have a "perfecting your craft" addition that explains how to play with the recipe without goofing it up. I think its on my Mother's Day wish list.